The ancestors of present day algae and plants established oxygenic photosynthesis as far back as 2.4 billion years ago. These ancestral organisms probably looked like present day cyanobacteria. During evolution these simple bacterial cells gave rise to the chloroplasts found in the more complex cells found in algae and plants. Cyanobacteria and their algal relatives, often grouped together and collectively termed microalgae or algae, have played a vital role in turning an oxygen-free planet into an oxygen-rich planet that has allowed life to flourish. Even today 50% of all oxygen produced through photosynthesis is made by cyanobacteria and unicellular algae. Microalgae were recognised by ancient civilisations as a valuable source of health foods, dyes, feeds and fertilizers and in today’s modern biotechnological world algae are gaining renewed attention as potential producers of biofuels, electricity and oxygen as well as green microbial factories for the production of commodity chemicals and high-value ‘ceuticals’ such as nutraceuticals, cosmeceuticals and pharmaceuticals. Nevertheless the ontology of algae in today’s world is clearly fragmented: environmental toxicity from algal blooms taints the promise of algal biotechnology. Unwanted algal growth often seems like a cancer of our environment, disrupting the normality of environmental ecology. Algaerium Bioprinter brings together these disjointed ontologies of the photosynthetic microorganisms through the form of bioinks and bioprinting that can process multiplicity in algae’s functionality. Print-outs can be food supplements, biophotovoltaic cells and/or air purification systems. Algaerium Bioprinter weaves fragmented multiplicity into one bioprocessing, one machine, and one practice – Algae Printing. It is an assemblage of Algaerium – aesthetic biological containment – and Algae Printing – digital cell deposition technology. The artefact consists of hanging bubble-column photobioreactors, in double-glazed skin, tubed and woven to glass bioink cartridges encapsulated within a transparent bioprinter membrane. The entirety of the Algaerium Bioprinter – the installation of design prototypes, demonstrates the domestication of algal biotechnology, making it accessible from laboratory-based research to industry to commercialisation. Algae Printing in the domestic environment opens up the possibility of empowering the consumer by providing direct access to biotechnological algae without the need to involve industry. Potential biotechnological applications include the production of bespoke algal foods of high nutritional content, the generation of electricity using bioenergy wall paper or the cleansing of air by removal of carbon dioxide (Sawa 2015, 2016). 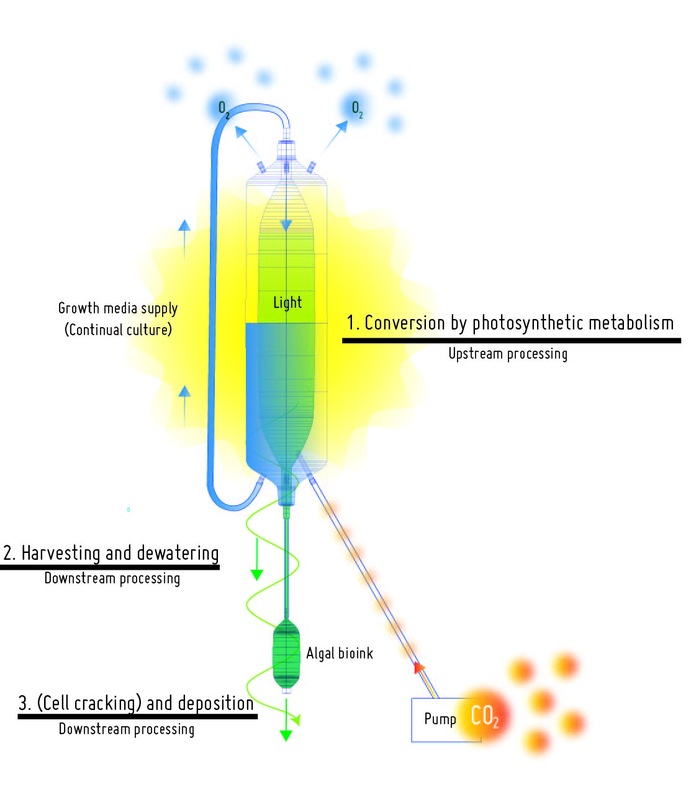 With a realistic view on production processes of algal biotechnology, this system visualises the integration of upstream (cultivation) and downstream (harvest & processing) bioprocessing: Algae Printing can combine a number of downstream processing from harvesting, dewatering, cell treatment to product fabrication and design. By doing so, this design suggests a new kind of accessibility and scalability for algal biotechnology (Sawa 2015). As a biotechnological artefact, concept and technology, my biodesign work stimulates “intellectual consumption”, a distinctive property of early biodesign works (Albano 2008). The viewer does not have to use it to be affected and influenced by the work, instead the act of seeing forms intellectual consumption in the mind- you become what Timothy Morton (2007) calls “reflexive consumerist” where the idea of consuming at its highest power in contemplation induces “free floating identity or identity in process”. The other side of this biodesign is “utilitarian consumption, the area of mass production and consumption not yet reached by most biodesign products (Albano 2008). The Algaerium Bioprinter and applications generated by Algae Printing explored both incubated cutting-edge to commercial dynamics of algal biotechnology. They mark a halfway house between intellectual and utilitarian consumption (Sawa 2015). Cardona, T., Murray, J.W. & Rutherford, A. W., 2015. Origin and evolution of water oxidation before the last common ancestor of the cyanobacteria. Molecular Biology and Evolution, 32(5), pp.1310–1328. Gualtieri, P. & Barsanti, L., 2006. Algae: Biochemistry, Physiology, Ecology, and Biotechnology. Kindle edition. New York: CRC Press. Guattari, F, 2000. The Three Ecologies. 2008 ed. London: Continuum. Margulis, L. & Sagan, D., 1986. Microcosmos: Four Billion Years of Microbial Evolution. 1997 ed. Berkley: University of Californian Press. Morton, Y., 2007. The Ecology without Nature. 2009 ed. Cambridge, MA: Harvard University Press. Myers, W., 2012. Bio Design: Nature Science Creativity. London; New York: Thames and Hudson; New York: MoMA. Sawa, M. 2015. 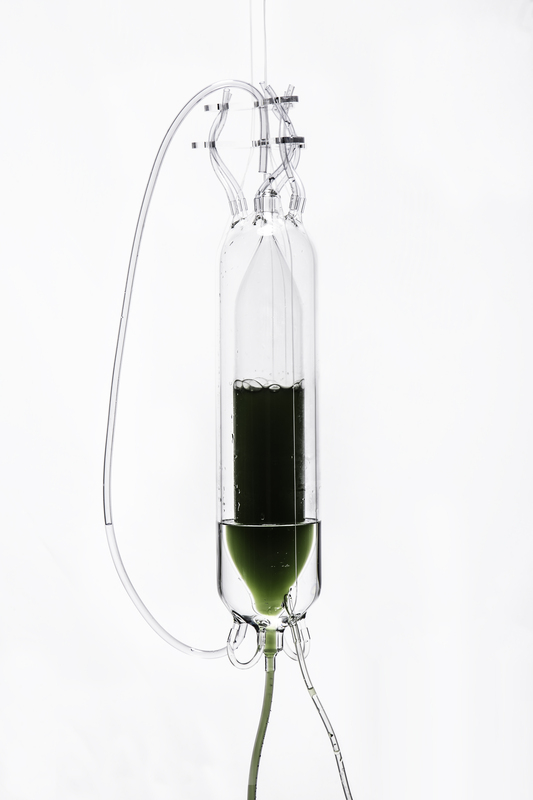 A design-led Investigation at the intersection of algal biotechnology and design. [Unpublished doctoral thesis] Central Saint Martins College of Arts and Design, University of the Arts London. Sawa, M., 2010. Algaerium. Thesis (MA), Central Saint Martins College of Arts and Design. Sawa, M., 2012. Algaerium. In: Myers, W. (ed.) Bio Design: Nature Science Creativity. London: Thames Hudson, pp. 88-91. Sawa, M., 2012. Interview. In: Myers, W. (ed.) Bio Design: Nature Science Creativity. London: Thames Hudson, pp. 266-267. Sawa, M., 2016. The laboratory life of a designer at the intersection with algal biotechnology. arq: Architectural Research Quarterly- Special: Architecture as Synthetic Biology, 20 (1), pp. 65-72.